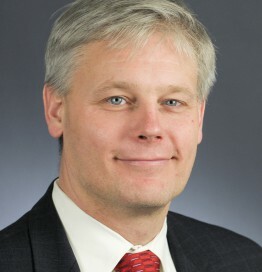 Rep. Paul Thissen was born and raised in the Twin Cities, where both of his parents were public school teachers. Paul attended Harvard University, and after graduating, he attended the University of Chicago Law School, where he served as an editor of the law review. He is currently a partner at the Minneapolis law firm of Lindquist and Vennum. Paul and his wife Karen were married in 1993 and they have three children: Emily, Griffin and Evan. Paul was first elected to the Minnesota House of Representatives in 2002, and after just four years of legislative service, he was appointed Chair of the Health and Human Services Committee. He was elected to serve as Minority Leader for the 2011-2012 biennium and led his DFL colleagues back to majority status in November of 2012. Paul also served as Minority Leader from January 2015 through the end of 2016. Paul was elected by his colleagues to serve as Speaker of the House in January of 2013.